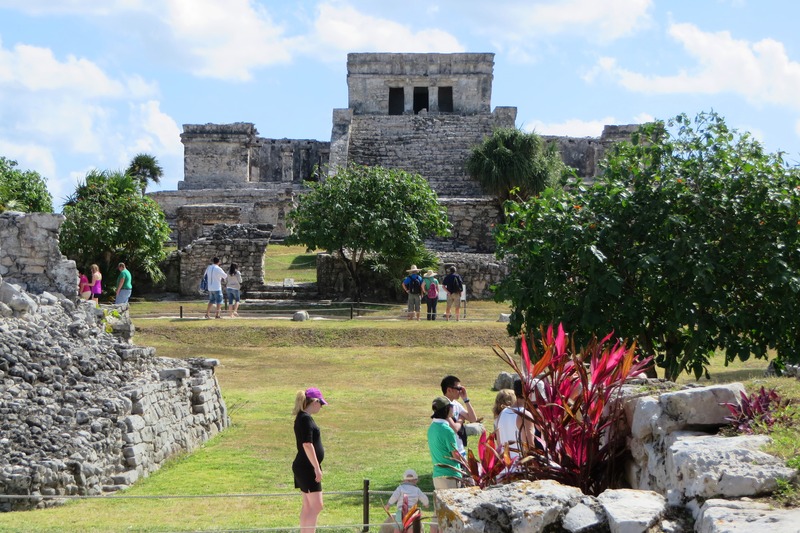 In January 2015, the sunny coast of Tulum, Mexico was an oasis in more ways than one. One of the most fascinating (and frustrating) aspects of visiting historic sites, especially ancient ones, is the way time becomes telescoped into a deceptively small package. There is no real way to grasp the magnitude of centuries, even when careful excavation reveals a wealth of solid clues. Still, most of us do linger fondly at these little oases, as Spender has noted. Why? Aside from their frequently beautiful physical appearance and appealing climate, I think there’s something unseen there that draws us in. As the guides spin their truth-is-stranger-than-fiction tales of civilizations beset by warring neighbors, epidemic disease and grisly cultural practices such as human sacrifice, we feel a bit happier with the modern world than we were before. It’s interesting to wonder how future centuries (assuming the world as we know it stands that long) will describe our societies, and how history will judge us. From my admittedly limited perspective, though, I think Now has a lot going for it. I hope that our weary generations will occasionally pause to dance as we tread the vast tracks. Good morning, Julia! So true! Your writing made me think how many people in history have thought that certainly they lived at the best of times. Unless they didn’t, like persons living under foreign occupation. “It was the best of times; it was the worst of times ….” what a different story it would be, had it been a kind of boring time. Meh. Probably a much shorter story, too! Susan, you quoted from one of my very favorite books. I do imagine that it’s much more fun to read about those times than to have been there, though. I often think about one of my favorite SNL skits, Theodoric of York, when I think about how people in the future tend to see the past, when those folks also were thinking about the ignorance of the centuries that went before. I guess we are all born at the right time, in the great scheme of things. Sheila, it’s also quite a contrast from the weather today, although the weekend was lovely so I can’t complain. Walter would have felt right at home in Quintana Roo, I’m sure. I saw some pretty birds, but none prettier than he is. Hope you have a great week too! And this’ll help things turn out for the best.. It is from Spamalot Julia! Good eye! We were crazy about Monty Python as teens. Made for good drive-in double features. Jim and I saw Spamalot as live theatre here in Edmonton. So funny. We often quote their crazy movies, “merely a flesh wound” LOL, I say that one a lot. I do remember seeing that Galaxy song. It’s very clever, but my favorite part is the pink sponge rollers like the ones I wore for years. 😀 Speaking of planets spinning fast, I can totally identify with the busyness. WOW how did it get to be February already? This winter has been short and relatively easy weather-wise for us, at least so far.